Usually the beginning of a biography is the most boring part, especially for someone with such an impressive career. 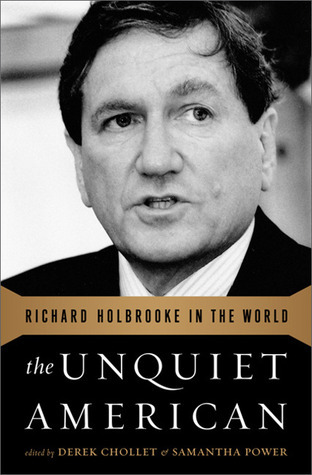 But the Unquiet American shows that Holbrooke's combative style was developed as a reporter at Brown, that his skill for manipulation came from closely observing history and the conditions on the ground in Vietnam. In many ways the Unquiet American reads like a sophisticated Irish Wake. The boozier it gets the more the same stories about suitcases at the Dayton Accords get repeated, and some chapters read as wistful essays reflecting more on the author's thoughts than on their subject. Samantha Power's intimate description of Holbrooke as mentor is unforgettable and touching. May we all have blustery mentors in pink Oxford shirts. This is a collection of appreciations of him written by his beltway journalism and political pals, along with some samples of his writing. Possibly interesting fodder for historians of the latter 20th century diplomatic policies and negotiations, but ultimately didn't work well.Whether intentionally or not, I found the collection characterized him as a spoiled young man who goes through life convinced of his own specialness. I tired of his company and the company of his fawning friends. There was some pathos in seeing how, at the end of his life, the times had passed him by and Obama barely gave him the time of day. If there had been more on that, I might have read more, but I got bored with a story of a guy who, as far as I could tell, rarely faced any struggles in his life (other than not getting hired by the NYT) and so I put it down halfway through. Had heard his name but never really knew who he was. I learned a lot about one of the premier diplomats of our time. More an anthology of some of Holbrooke's writings and men and women he worked with during the course of his long and esteemed career in foreign service. Richard Holbrooke was a public servant almost continuously since he joined the U.S. Foreign Service in 1962. He died "in harness," suffering the fatal collapse that led to his death, in the State Department. This book is a wonderful collection of essays by people who knew him, many who worked with him, and one by his wife, Kati Marton.They present a picture of a brash, unorthodox fighter, ambitious and egotistical to be sure, but one wedded to fighting for the America he believed in.The essays follow him from his early days as a young Foreign Service officer in the quagmire of Vietnam to his last days as U.S. Special Representative for Afghanistan and Pakistan. In between, he served in various jobs, including Managing Editor of Foreign Policy magazine, U.S. ambassador to the United Nations, twice as an assistant secretary at the State Department, and most famously as chief architect of the Dayton Peace Agreement that ended the 1990's war in Bosnia.The quote that I remember best is one from an article he wrote for The New Republic on May 3, 1975, "Pushing Sand" and reprinted here about Vietnam: "But then finally it all seemed to come down to one simple, horrible truth: we didn't belong there, we had no business doing what we were doing, even the good parts of it." Not exactly uncritical. This book is a panegyrics of essays, by wife and admiring friends. Holbrooke was a darling of Carter, Clinton, N Y Times. He polished up his creds a lot. Another one of those guys who are "smartest" and proved it by showing how everyone else was stupid. Cozied up from Rusk to Clifford and other power brokers. Made loot on Wall Street while of course being "bored." This is usually how I read "speaking truth to power" because the speaker has a corner on the truth and so it seems he was right about everything from 1960 (age 20) on. Thin skinned, everyone else had to be thick skinned. Of course, his last assignment was H Clinton appointment for Afghanistan where his performance was a disaster partly because he couldn't get along with anyone. This an outstanding book written using Holbrooke's own writings over the period of his diplomatic service. It is connected with commentary by his friends and mentees (those he mentored) and gives a wonderful picture of some of the most recent history of diplomacy in this country. The chapter on the Dayton accords and the closing chapter are especially strong. He was defintely a "doer" in the service of his country and an unabashed flag-waver and critic all in one. History buffs will enjoy it although there is some disconnect; be sure to read the title of each chapter and the date. Richard Holbrooke was the man and lived a pretty insane life. The structure was much more interesting that a standard biography. It's basically collection of essays about Holbrooke mixed in with essays previously published by the man himself. I learned a ton about the history of the late Cold War and the conflict in the Balkans in the 90's. This could be considered a solid manual for international diplomacy, in my opinion. This is a fascinating account of the life of a Super Diplomat, told both through the eyes of those around him and through his own writings. Having just read the Steve Jobs biography I was struck by the similarities -- both men had a kind of genius and the audacity (and ego) to be phenomenally successful professionally. But both were also such flawed human beings that they made life miserable for many of those around them. A great overview of a unique American diplomat. It was published as a tribute, so don't expect too much in the way of criticism. That being said, Holbrooke's been front and center on Vietnam, the Balkans, South Asia, and the role of diplomacy in U.S. foreign policy. This serves as essential reference for one crucial perspective on these issues. Interesting. It contains essays by others about Holbrook and articles about foreign policy that Holbrook wrote over his career. I enjoyed the essays a lot but Holbrook's writing not so much because they obviously gave the perspective at the time they were written which I didn't find all that interesting. Thoroughy enjoyed the book. I admire people who have such clear determination in the face of adversity.Richard Holebrooke was brash, abrasive and extremely intelligent. No friend or foe ever questioned where Mr. Holebrooke stood. This is a well deserved tribute to a great diplomat.Perhaps his personality was the reason he never achieved his life long dream of being Secretary of State. This book is a truly superb exploration of the life and times, as well as the intellectual endeavors, of one of the most remarkable individuals in post-war American diplomacy. Samantha Power is one of the editors and she is an extremely insightful writer and thinker.